The original image of man in the era after the apocalypse. In this text, I will use the book "Dark Ecology" of Timothy Morton as a framework of my argument. I will elaborate on my artistic project on bare foot running, and how this type of sports, as a expression of a primitivistic philosophy illuminates the point Timothy Morton makes. The tendency to go back to an original human beholds an anti-Posthumanist agenda, a delusional return to a human without technology, and believe in the autonomous human subject. As being an artist I will include my own artistic practice and the work and thought of other artists who blur the boundaries between the traditional categories of human / animal, and human / technology. There is a variety on opinions about the improvement of health and the reduction of injuries when it comes to bare foot running. Professor Lieberman’ popular research concerns on how shoe technology never decreased the amount of injuries of ankles and knees of professional and amateur runners. In his articles Lieberman uses the evolutionary development of man to illustrate man's most distinct qualities compared to other animals. It is thanks to his ability to sweat that man is able to run for very long distances and exhaust the antelope and take it as prey or escape from deadly predators. The running shoe equipped with cushions, like for example the Nike Air Max, came in full development in the seventies. The cushions not only soften the impact on the foot, they also cause an impact by an upward pressure. Lieberman recommends using the minimal footwear runners used before, without the air pads or cushions, or go completely barefoot, using the front foot technique instead of rolling the foot off from the heel. Around the time his research was made public, a book was published by journalist Christopher Mc Dougall. Mc Dougall wrote about the rediscovery of bare foot running through the encounter with an indigenous tribe deeply hidden in the Copper Canyons, in the north of Mexico. In his book ‘Born to run’ Mc Dougall presents his discovery as the elixir not only for running, but so many other problems of man today. As an adorer of the ‘primitive’ lifestyle of the Tarahumara tribe, he concludes: “Left alone in their mysterious canyon hideaway, this small tribe of recluses had solved nearly every problem known to man. 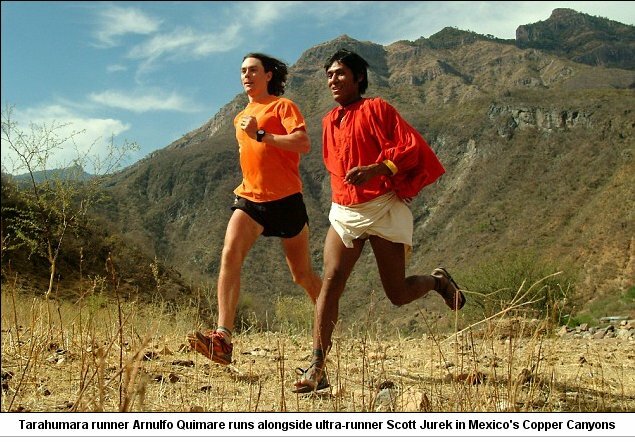 Name your category – mind, body, soul – and the Tarahumara were zeroing on perfection. It was if they’d secretly turned their caves into incubators for Nobel Prize winners, all toiling toward the end of hatred, heart disease, shin splints, and greenhouse gases.” While leg injuries are mentioned in one breath with climate change it proposes that technology is the most important problem to humanity. It is indicated as a phenomenon outside of human, making man weak and lazy. Hence, what is technology? And how can we define technological science if it is used as a final solution by the Solutionist movement and the Transhumanists, or seen as the cause of all evil by Anarcho-Primitivism? Does an authentic human condition exist? And how does this desire to an authentic identity can be understood in the contemporary political discours? And finally, what could an artistic response to these questions be? Wilfrid Sellers systematical analysis on how the human subject is constructed, gives an inside of the coming to be of man. In “Philosophy and the Scientific Image of Man” he introduces two images of what is human subjectivity today. In the dawn of humanity our relationship to the perceivable world started changing, signifying the transformation from the ‘original’ pre-conceptual image to the ‘manifest’ image. The ‘manifest image of man-in-the-world’ contains man perceiving the world and constructing an identity. The ‘scientific image of man-in-the-world', the image of theory, a human capable of postulation, came after. The transformation of man unaware of himself towards a man able to see himself, comes with a paradox. For it is only possible that this conceptualization of being man appeared holistically, a jump into coming to be. To be able to think conceptually you can only think in a framework of social negotiation; of evidence and measurements, relevance and correctness. By this leap we can only conceptualize a return to a kind of original human, by being within this conceptual loop. So how this occurred to us is covered in mystery, but it is excluding us from a return to a former state. The manifest image tells us how man encountered himself, as an accidental evolutionary feature, with a set of conceptions which could have been drastically different, if not he had seen himself as a Special Creation. 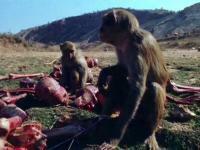 In Patrick Jolley’s short film ‘This Monkey’, a group of monkeys is coming down from the hills, into an abandoned town. They roam around for a while in the empty houses, before the run back into the hills. In the end of the film we witness a shocking scene when the monkeys arrive at a spot where a catastrophe took place, and start eating the flesh off of human carcasses lying in on the ground. The scene is uncanny because we have sympathy for these monkeys, they are after all closely related to us. In this moment of deep horror, human construction of a human centered universe collapses into a world-without-us. The 'manifest' and 'scientific image of man-in-the-world' are idealizations, not strictly separated but intertwined and always in motion. All the different sciences use different methods and quantifications, which should not be equalized, but recognized in their intrinsic identity, to map the world. These differences lead to different scientific images of man as well. Postulation frees itself from time and place, it is an infinite phenomenon, but of course it influences time and place deeply. The way we theorize empirical studies, for example how findings on the North Pole concerning melting icecaps, influences our postulation on the future of climate change. Or, when neuroscientific research explains certain mechanisms of acting, it becomes part of theories on human subjectivity. The scientific image is within the manifest image of how man conceptualizes itself, and keeps re-conceptualizing itself. To Sellars the way the dualism of the scientific with the manifest could be interpret, as a more complete and honest relationship with ourselves and the world. The danger of postulation, of the ‘scientific’ being unbound from the ‘manifest’ is the idea we live in a place which is complete designable, we can modify to our needs with no consequences whatsoever. We can make a footmark in the sand and the sea will wash it away. These concepts we can find within Transhumanism. Stating that we are radically different from the one-cell forms of life from which we originate we are determined to progress. But although scientifically superior to physics we only have seen a glimpse of what man is capable of. Huxley states: “People are determined not to put up with a subnormal standard of physical health and material living now that science has revealed the possibility of raising it. The unrest will produce some unpleasant consequences before it is dissipated; but it is in essence a beneficent unrest, a dynamic force which will not be stilled until it has laid the physiological foundations of human destiny.” Transhumanism according to Huxley understands humanity as a slowly, maybe fumbling ascending development, of a species improving itself as a wholeness, which could and should be accelerated by scientific means. For Huxley Transhumanism is all-encompassing, it should overthrow existing human institutions to rationalize society according strict premises. Huxley’s Transhumanism feeds technology and logic with the destiny of a species. Therefor it gives humanity a purpose, a reason to progress. This is the point where the scientific image detached from the manifest image can become actually destructive. The problem of Global Warming is such a problem. We can rationally diagnose it, but there isn’t a feasible rational solution. These days, according to Francisco Bernardo Bifo, Transhumanism is still a very strong motivation for action in for example Silicon Valley. These ideas again follow the logic of determinism, a range of actions that will take place in a linear way and therefor reduces the subject to something which is possible to simulate algorithmically. It is a philosophy but also a project in companies like Google, and it’s dangerous because according to this logic, human experience is purely based on behavior and cognitive experiences. And this is how these companies build their computer programs and social networks. Bifo emphasizes the complexity of human experience related to the complexity of embodiment: a product of epigenetics, irrationality and mutations. In the work “To Stab” of Nelmarie du Preez, 2013, a performance of Marina Abramovic executed in the seventies is reenacted by the artist. 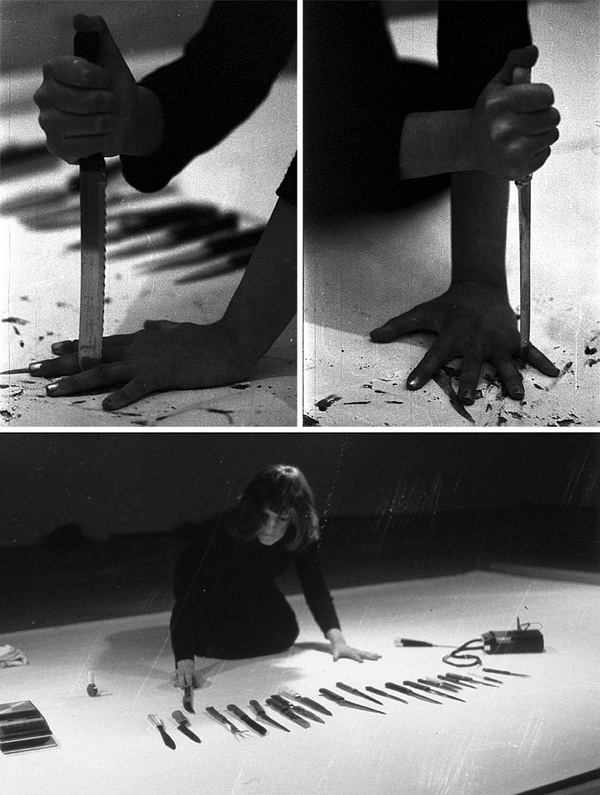 In the original version, the locomotion, precision and control of Abramovic herself are tested in a risky game of continuously stabbing a knife between her fingers into the table. This doesn’t go without causing injuries on the artist hands, visible in the documentation by the bloodstains on the table leaf. Du Preez echoes this game of orientation and locomotive precision, but hands the knife over to an electronic robotic arm. The arm executes its orders perfectly not even causing a scratch on the human body, though the tension of giving such dangerous job to an algorithmic controlled device never ends during the whole length of the video. Du Preez shows how trustworthy we are towards technology without realizing it. We could find ourselves quite soon driving around in autonomously moving cars for example. They don’t need you handling the wheel. 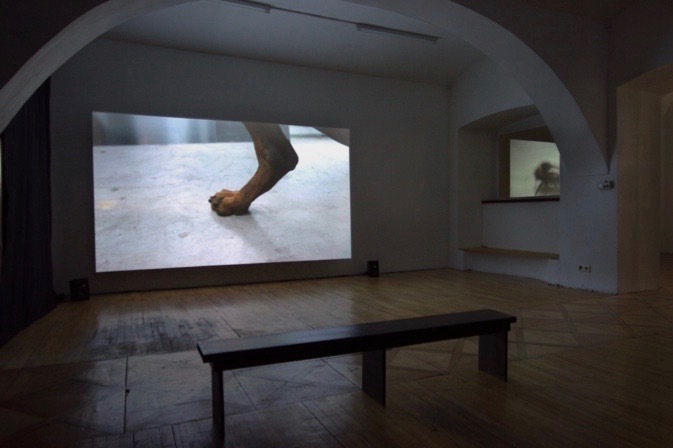 But moreover, it picks in retrospect the work of Abramovic out of the psychoanalytic interpretation, where the focus lies on self-mutilation, physical and mental trauma, common in the seventies and eighties, and places it in the Posthuman discourse of human autonomy, control, and agency. To get a better understanding of how the 'scientific image' gradually separates itself from the 'manifest, empirical image', we could follow Timothy Morton elaboration on the idea of Dark Ecology, and his view on Solutionism. Solutionism is the prediction of a future dominated by technology companies, because they can provide you a smooth and frictionless existence, much better than the slow process of politics, therefor an algorithmic driven world run by Silicon Valley is preferred over elected government power. In the view of Morton science often takes on this role of salvation, of the way out of for example irreversible ecological processes, caused by human exploitation. These processes were gradually caused by human action mostly executed in a non-conscious way: while heating our houses and driving in cars we weren’t deliberately destroying ecologies on the planet. Science and technology gave us the possibility to live more conveniently and act without much awareness, but it also gave us the tools to postulate on what matter or ecology 'really' is. From the scientific and philosophical realization that perceptible objects in the end are ‘false’, the response should not be that the planet is endlessly modifiable to human purpose. This falseness is a falseness in perception, therefor reason; systemizing these false perceptions, and should always be questioned. Because in hubristic ways, this is leading us away from noticing the unpredictable consequences of our actions. My project around bare foot running, tries to unfold the complexity of our ignorance towards our interconnectedness with other ecologic systems, and our rock-solid trust in human autonomy. We are part of something materialistically so much bigger than us, not as separate singularities joining the club, but of porous bodies with the alien already inside. We are a constellation of uncountable living and non-living entities and systems. In Rachel Mayeri’s artwork “The Life Cycle of Toxoplasma Gondii”, the influence of a parasite to human subjectivity is explored. Mayeri usually works with animals. In this piece consisting of a wall composition of small video-screens, she shows our affinity with cats. These creatures, harmless as they seem are also the carriers and spreaders of the Toxoplasma Gondii parasite, which causes cysts in muscles and even eyes and brains of other animals. Mice and rats get excited by the smell of cat urine and lose their anxiety for cats causing a 'fatal attraction' in a weird bio-chemical caused loop. These cats put mice under a deadly spell. Recent research shows that the Toxoplasma Gondii parasite produces personal changes in the people who carry it, women can become more easy going and gregarious, and man might get more jealous, suspicious and sloppy, and therefor actually causing more car accidents. Human affinity with the cat is not proven to be a parasite caused emotion, but the work does suggest a different look on how feelings, affinities and aversion are developed. The non-human intruder is becoming part of a network of neurotransmitters and a responsive brain, and what you thought of as a sense of self, suddenly becomes something much more alien. Sellars reminds us how Posthuman thinking is different from the Cartesian thinking, what dominated the Enlightenment. For Descartes, building his theory in a time science had not reach yet the contemporary neurophysiological level, the 'scientific image of man-in-the-world' didn’t reach the inner world of man. For him sensations, feelings and emotions were irreducible to complex cerebral processes, and not correlated to how physical objects ‘really are’ complex systems of imperceptible particles. As certainly for conceptual thinking, he couldn’t think of any possibility for it to be the microscopic objects, the matter in motion what conceptual thinking ‘really is’. Then how could we define technology and technological thinking? In the anthropologic view of Lévi-Strauss the difference between a horse and an axe lies in the possibility for the horse to reproduce, and the axe of being completely subsumed to human meaning. The axe can’t reproduce itself. But what is an ax really? It is a stone with a sharpened side used for cutting meat, bones and wood. In a misty moment in pre-historical time, eating got a technological component. Over generations the axe gave the human instructions and started to reproduce itself, because the direct connotation humans developed of 'preparing meat' with the 'ax' object. This way of generating acknowledges that human acting deriving from a neurophysiological process of many non-human components, and an embodied action of splitting stones, is similar to the reproducing horse. It creates generations, shaping its context and adapting to it. Conceptualization of thought is therefore technology, and technology is conceptual thinking, it is how we shape the world and how what we shape, shapes us again. Therefor you can say politics is technology as well. ‘Stay’ is a video I completed in 2017. 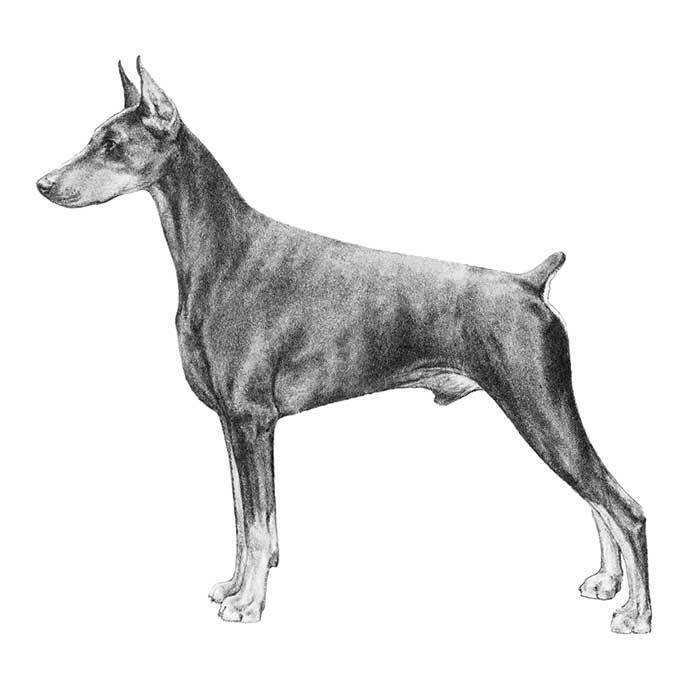 In a car workshop type space, between the pristine surfaces of car parts, archetypes of mass production, a construction of power is unfolding between a Doberman Pinscher and its owner. The camera floats through the space frequently encountering a dog posing in standstill, commanded by a disembodied voice coming from somewhere in the workshop. A Doberman is a special breed, it is constructed out of many different types of dogs for the purpose of guarding, often used by police or military. It is specifically gracious, loyal, and potentially aggressive to strangers. It needs severe training. Both the owner’s and the dog’s consciousness are formed within this relationship. 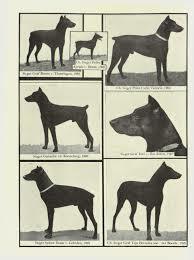 By the obedient appearance of the dog, it seems to concede to the rules it’s been given. But by knowing the rules it starts to gain power itself. In the constant intermingling of the concentration on de dog’s behavior and the hypothetical assumption of what the dog might do, we can recognize a 'manifest' and a 'scientific' vision, being different but in continuous movement. Morton underlines the existence of power structures and hierarchies, and tries to unravel them. He explains how the emergence of agriculture strongly accelerated human influence on the planet. Religion was completely tied to this development. The agricultural religious era started somewhere with the Mesopotamians. This is where we still are today, in this thin slice of geological time. Timothy Morton relates the emergence of a mono religion to the beginning of agricultural time, in a way that religion served to come to terms with god for the sinful invention of agriculture and the mastery of the soil. Here man created Genesis, the conceptualization of innocent nature and guilty bare-land which should be made fertile for human use. If we recognize the same features of the reflexive loop of sin and salvation generated by the religious spectacle and tied to agriculture, we could recognize it in the pre-programmed western response of the romantic withdraw from culture. Agriculture made us sinners. But in Morton’s view this isn’t an escape but an ignorance, as he explains “This now started somewhere, sometime. It is bounded. Yet to think outside it, since that very outside is defined by it, is to think within it.”  To be able to eat Paleo foot you need the agricultural industry to provide you the meat, to run bare foot you can rely on clean streets and a good health system when things go wrong, to refuse vaccination, you rely on other medication for your children. In our obsession for health our post human condition is being denied, when 'natural' is placed oppositional to 'technological', and in distrust of medical science 'natural' becomes synonym for 'healthy'. If agriculture is felt as a sin, echoing dreadful fate of Adam and Eve being send away from the garden of Eden for being disrespectful towards God’s creation, then the allergic reaction to it would be a primitive one. The Paleo diet contains the food patterns of Paleolithic humans, of hunters and gatherers: vegetables, fruits, nuts, roots, meat and organ meats, and excluding the Neolithic (the term used for post-Mesopotamian cultures using agriculture to feed themselves) food inventions such as: dairy products, grains, sugar, legumes, processed oils, salt, alcohol and coffee. Paleo diet supporters assume human body couldn’t keep up with the speed of change in food culture, because digestion is essentially the same as during pre-Mesopotamian times. To save our body from modern times we should get reacquainted with our origin, an idealized static base form we’ve been mistreating for such a long time. The idea behind it is that the Neolithic diet, a diet created in the agricultural era leads to diseases of affluence, such as cancer, diabetes and heart disease. Not only it is highly probable the Paleolithic humans did eat wild grains (bread) and legumes, the thesis that they didn’t die of diseases of affluence might be because of a much earlier death already. It is saying there is a pristine type of human we can always go back to, as there would be a pristine type of nature we can always re-establish. The Paleo diet is an example of Anarcho-Primitivism, a philosophy pleading for a retreat from so called modern achievements by science and technology. For a radical Primitivist as John Zerzan, there is a choice to make: either to go back to a pre-technological type of living or stay within a society where technology is all around making people physically weaker, more violent, less social, and more institutionalized. The use of medication is considered wrong, because infectious diseases, cancer etcetera is a result of the Neolithic way of living, of concentrated groups of people being in cities, exploiting the planet and themselves. If the authenticity of a human condition is something to be rediscovered, we can easily relate this to the comeback of cultural identity. In a reactionary reflex towards the complexities of fast changing world and insecure existence, the West is withdrawing into nationalistic sentiment, aggressively protecting a fictional common identity, which was never fixed nor purely Western. If we investigate the bare foot running movement more closely, we can see similar kind delusions. Of course, running on bare feet isn’t a wrong activity in itself. It only reflects a romantic and western vision on a retreat to an original type of human, as a solid concept. And in the image of an original man, representing human essence, certain tribes or even nationalities are placed in that image. When we think the Keynians are as good in long distance running because they run bare foot for all their lives, we’re denying the fact that it is a matter of contingent luck of perhaps gene combinations and a complex diversity of circumstances. Thinking that we could be as good, just by copying their behaviour is thinking in a different kind of Solutionism. There are opinions going around that if they would have expensive shoes, they will lose their superiority. Again, we think we are in control of our success, and by idealizing the penniless African man, we feel good about ourselves. We cracked the code, and defined the other. Donna J. Haraway’s “Cyborg Manifesto” attempts to take the feminist and political left movement away from their proclaimed universal subject based on essentialism. Essentialist thinking takes the point of departure of an existence of intrinsically different and characteristic natures or talents between categories of people, science, philosophy and education. These differences should be discovered, defined and expressed. For Haraway this paralyzes the possibility to regenerate and re-engineer new futures for the left, because it still follows the lines of essentialism and fideism through its appeals to nature, authenticity and the idea of an original unity: the return to ‘nature’. There’s a big danger of revolutionary desires based on the realization of our original ‘essence’, because not only “misses most of reality”, it also is constructs its theory on illusory distinctions, which are echoing the power structures it wants to destroy. Is it possible to develop an artistic practice concerning the complexities of ‘human’ and ‘nature’ without taking a position of the Sublime, a position of awe, giving nature in the time of mechanical reproduction a supernatural glow? How to represent reality in art, a reality which is immensely complex and contingent and for which we are mostly blind? This reality is only visible in a different time scale, outside our frame of perception, or either too big or too small to comprehend. Are there ways to bring this blindness into postulated thinking, and how could we make these theories tangible? We found ourselves inside of the problem, because we keep thinking within this protocol; a utilitarian vision of ecological systems with a solid separation of the human and the non-human. Art should constantly challenge the idea of essentialism, a kind of trust that no matter what we do, there is always something underneath which will stay untouched. Because of this delusional concept, everything around us can be turned into something for human use, and appearances which seem concerning can be wiped away as temporary. This essentialism also keeps human in a static position, restricted to a category where it is isolated and centered, constructing hierarchical categories within this category of the human species. To be able to recognize the non-human into man’s actions we could work on an artistic practice than can redefine subjectivity, agency and control. What can we say anything about what art can accomplish? Artist Amanda Beech formulates some concerns on how Object Oriented thinking could be appropriated to the politics of art making. If the object, in the physical form as well is in the form of ideas, become part of a reflexive mechanism between the viewer and the viewed, potential autonomy of these art objects must be considered. And even more the admitted property of agency is a feature which needs closer investigation. If the traditional hierarchal relationship between author, object and audience is dissolving, and the claim of the Avant Garde, that an artistic object is directly causing social change, is no longer valid, how to come towards an artistic attitude which is critical without contradicting itself, and realistic in terms of access and influence. “We are not fixed at the center of any possible future, and any sense that we can master the world, in order, to create things, such as change for example, does not guarantee that our expectations will be met. However, it also does not guarantee that they won’t either.” The modernist idea of uplifting humanity by art, or perhaps the local activist approach might be vain, its counter response to be cynical, because it doesn’t do anything anyway, is equally vain. It shows two sides of the same coin, the false idea of a human able to predict, knowing its future and its past.